Tips are streaming in about the Nexus One's data problems. No, not those data problems! This is new, and it's leaving virtually all Nexus Ones without any data coverage at all. What gives? I just got off the phone with T-Mobile who transferred me over to HTC Technical Support because I was not receiving data on my phone, opening the Android Browser indicated I needed to contact T-Mobile and add a DataConnect Plan in order to receive data on my phone. T-Mobile check everything on my account & appeared ok then transferred me to HTC Technical Support who indicated there currently is a problem with most Nexus One devices connecting to Data Services on the T-Mobile Network and they hope to have it fixed sometime this morning. This seems to be the common experience: The prompt to buy a new data plan, the call to T-Mobile, the transfer to HTC support, then the claim that everything will be fixed soon. Some users are reporting HTC reps saying all HTC devices are having issues on T-Mobile, but the evidence—the growing thread of reports from users—doesn't seem to bear that out. This looks like a Nexus One problem, and a strange one: Without a carrier fault or software update, why would a phone just stop working? I'll let you know when the dust settles—throw your theories in the comments. —Thanks, tipsters! UPDATE: The issue has been fixed. 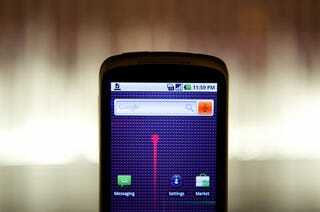 Nexus One owners were the only ones affected, though the blame seems to fall at T-Mobile's feet. To anyone still having issues: just restart your superphones.